Let’s get one thing out of the way right now: There’s an endless abyss of content online today, and certainly no shortage of articles about content marketing, either. I’m always a big fan of learning as much as you can through whatever means you can find. So, yes! Read those articles and refine that content. But a lot of the pieces you’ll find focus more on the writing of content itself, or the topics that it centers on. And sometimes, we could use a little more guidance in order to kick that content up a notch, into something not only click-worthy but also read-worthy. To help you out, I wanted to give you a crash course in my favorite tools that are intuitive, quick to use and can empower you to totally upgrade your content for blog posts, emails, eBooks and any other content marketing medium. So let’s dig into them, shall we? Each of us has our own voice and rhythm in our writing. And while this is a great thing since it guarantees content from different people will be fresh and unique, it also can make it hard for you to gauge how readers will receive (and perceive) what you write. You might try to make a joke, for instance, but your readers could miss your intended tone and be offended. Or you may try to clarify something complex, and end up confusing your readers even more. 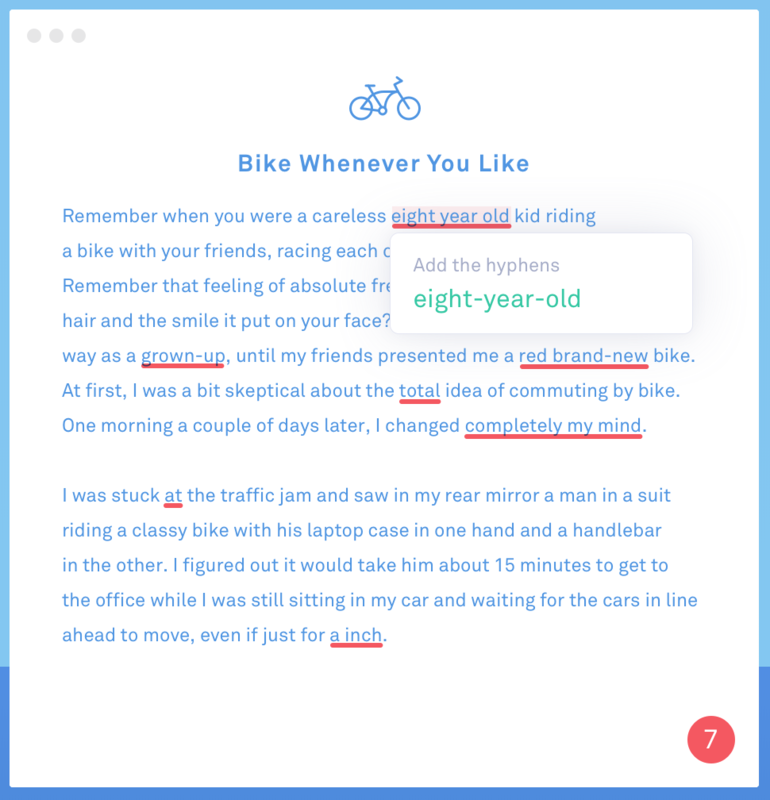 You can use Readable to measure how easily your text can be read, and also to give you feedback about how well you’re targeting specific words or phrases. This can be enormously helpful in knowing how to make little changes in order to better resonate with your audience. Oh, grammar... my absolute "frenemy" if there's ever been one. We can all attest to even the very best writers stumble over grammar pitfalls now and again, especially if you're exhausted, writing in any format that's not a tool with built-in fail-safes, or you’re writing in a rush. While spellcheck works decently, it definitely doesn’t catch everything. Don’t let your otherwise compelling content pieces be viewed as less than credible due to oversights in grammar. Use Grammarly, which corrects more types of spelling, grammar mistakes and recommends better than any other software out there. The BEST PART? 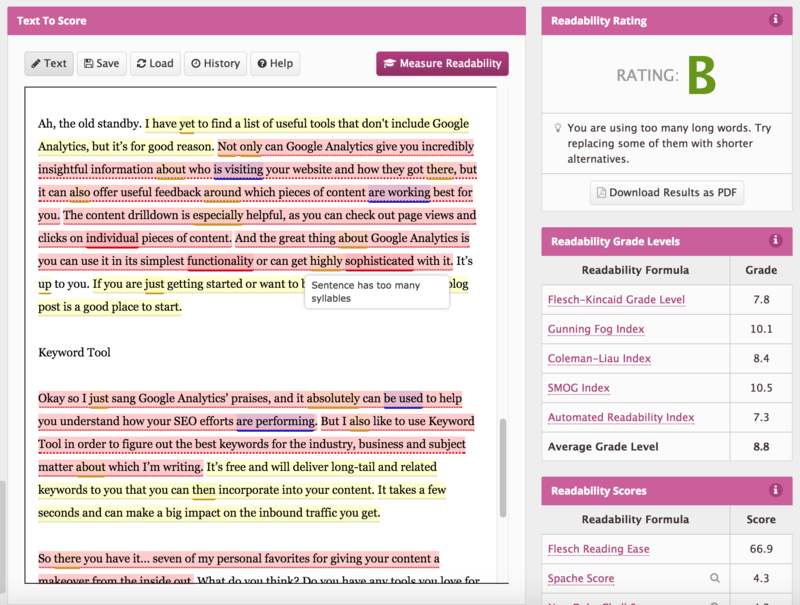 Grammarly has a ton of plugins you can install directly in your browser or in your Microsoft Office suite, so regardless if you're writing an email in Marketo or some micr0copy on your WordPress site you have a little grammar helper there to help your content sing. You'd be crazy not to install this tool asap. We’ve all been there… you’re wrapping up an awesome new blog post and all that’s left is putting a bow on it (a.k.a. deciding on the headline). This can sometimes take the most time and be the most frustrating part. How do you tease the substance of your post, while packaging it in a new way that’s inviting to readers? It’s a tough balancing act to strike all the right chords. But luckily, you don’t have to struggle with it anymore. Turn to Sumo’s “Automatic Kickass Headline Generator” instead. 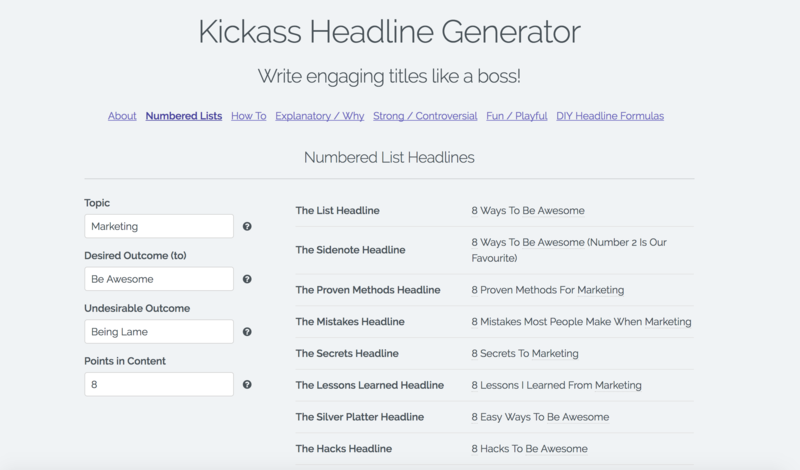 After filling out minimal fillable fields, plenty of clever and attention-getting headline options will appear before you, begging to be used. Voila. Another painstaking component of content generation is handling the workflow and managing all the moving parts (content calendars, the status of current pieces, communication between writers and editors – and beyond). If you want to cut through all the chaos and get a grip on your content, you need ClearVoice. This platform is a jack-of-all-trades, but I find it especially useful for collaboration and workflow improvement. And if you’re in need of a freelance writer or editor (who isn’t at some point? ), you can also be connected with well-trained, professional freelancers who are ready to help you at a moment’s notice. We at Six Bricks are BIG fans of these guys and the product they are putting out into the world, it's an absolute must-use platform in our books. I mentioned Sumo’s headline generator, and I also want to call out Portent’s content idea generator because it functions a bit differently and fills a separate need. All you do is simply type in the subject you’re planning to write about (be as specific or vague as you’d like), and Portent will suggest a title for you, along with reasons why that title will be captivating. You can use this as your title, but I like to use this more as an overall idea generator. If I’m stuck in a rut or need a little inspiration, I’ll enter a specific subject and see what Portent suggests so my wheels can start turning about new topic ideas. Give it a try, and be forewarned – you might get hooked. Ah, the old standby. I have yet to find a list of useful tools that don't include Google Analytics, but it’s for good reason. 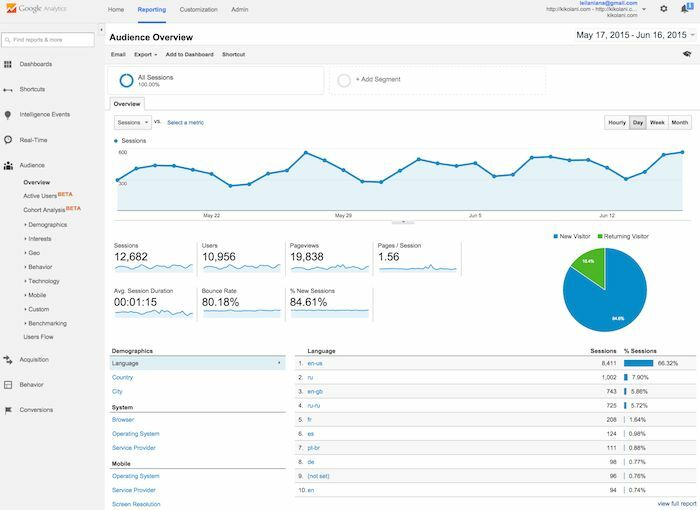 Not only can Google Analytics give you incredibly insightful information about who is visiting your website and how they got there, but it can also offer useful feedback around which pieces of content are working best for you. The content drill down is especially helpful, as you can check out page views and clicks on individual pieces of content. And the great thing about Google Analytics is you can use it in its simplest functionality or can get highly sophisticated with it. It’s up to you. If you are just getting started or want to brush up on the basics, this blog post is a good place to start. Okay so I just sang Google Analytics’ praises, and it absolutely can be used to help you understand how your SEO efforts are performing. 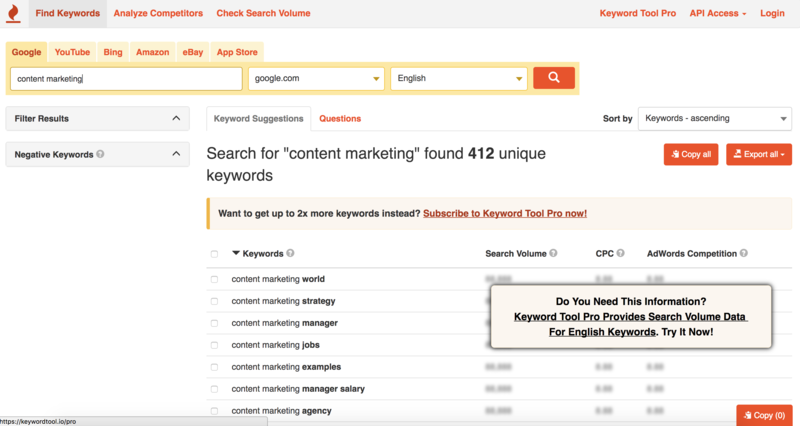 But I also like to use Keyword Tool in order to figure out the best keywords for the industry, business and subject matter about which I’m writing. It’s free and will deliver long-tail and related keywords to you that you can then incorporate into your content. It takes a few seconds and can make a big impact on the inbound traffic you get. So there you have it… seven of my personal favorites for giving your content a makeover from the inside out. What do you think? Do you have any tools you love for improving your content? I’d love to hear about them! Whichever tools you end up using, the most important thing is that you’re not getting complacent in your content. As long as you’re continuing to push yourself, learn and deliver even more value through what you write, I think we can all agree you’re in good shape. 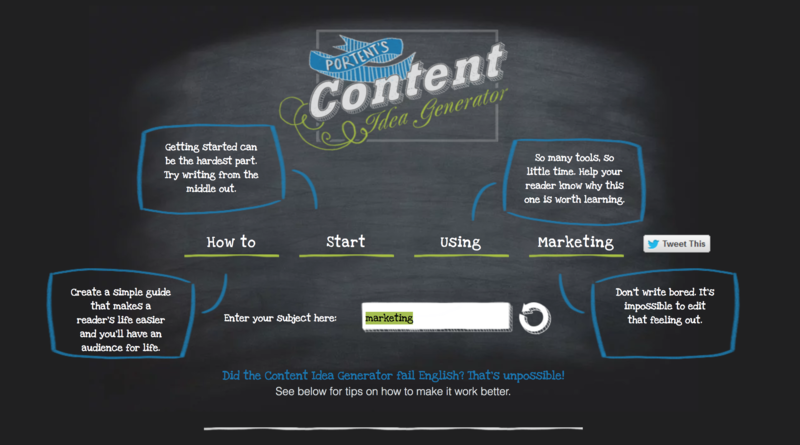 If you want more Content Marketing tips, check out our Content Marketing Path! With a background in both graphic design and adult education and training, Natasha brings a unique creative eye to everything she’s apart of. Using both her analytics skills and artistic know-how, she can quickly synthesize raw content/data and convert it into anything from an infographic, an informative video, a snazzy new user interface, maybe even a cute animation or really anything else you can think of! Natasha has an extreme passion for marketing, education, and the user experience that helps take LeadMD and their clients to the next level. When Natasha is not designing or writing curriculum, she enjoys spending her free time with her amazing husband and super cute little girls. She’s also REALLY into reading comics (geek alert!) and watching/reading as much Game of Thrones as humanely possible.